It’s fair to call Trigun a classic, I think, for all that Western audiences were introduced to it in this century, in 2003. It originally aired in Japan in 1998, but I can understand the delay, as there wasn’t even a proper platform for it. Audiences back then, and even today, have had difficulty accepting cartoons that are not entirely meant for children, so there some special changes had to be made. I was barely old enough to catch it right around when the first batch of Adult Swim programs aired on Cartoon Network. Whatever hoops they had to jump through to broadcast it here, I’m glad they did. It’s the sort of anime that inspires both essays and intelligent debate between friends, and it would have been a shame to miss it. There’s a reason it’s remained uncontested as one of my favorites. 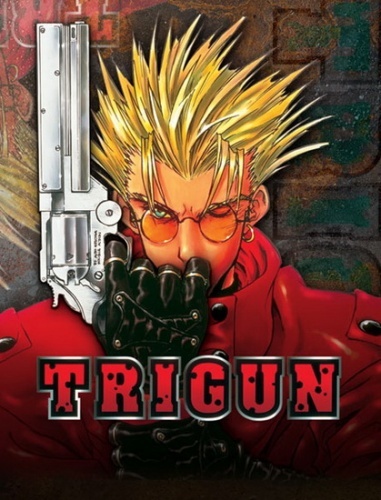 Trigun is a science fiction story set on a distant desert planet with two suns in the sky. Humanity left Earth behind a long time ago, setting out in great ships to find a new planet to colonize. But something went wrong, so horribly wrong, and instead of gently landing on a new Garden of Eden, humanity crashed into an oversized ball of hot, dry sand. That was about a hundred and thirty years ago, and humanity has been fighting to survive ever since, to tame the planet and turn it into the green and growing paradise they dream of. They do not suspect that the same force which made their ancestors crash in the first place is still alive and creeping within the shadows, an unseen menace that longs to wipe out their entire species. If humanity ever so much as suspected the existence of this threat, let alone its power and its drive to kill them all, they would collectively soil themselves. What humans do know, or think they know, is the legend of Vash the Stampede, the Humanoid Typhoon. Their world has become one riddled with outlaws in the style of the old American West, but with zany quirks and machines in addition to their guns, all of them spilling blood however they like on a mere whim. The greatest and most terrifying of all of them is the mysterious Vash, a living legend, practically a myth come to life, the Devil’s own helper, who sweeps in like a storm and annihilates everything and everyone in his path without taking so much as a scratch in return, a man who destroyed an entire city of a millions people once. Surely, he is the very soul of evil itself, yes? Behold, the face of terror itself. As is the case with rumors, they tend to be, at best, highly embellished, if not flat-out wrong. There is some truth to them, of course, he is one of the most dangerous people on the planet, hands down, with physical and mental capabilities that few can even begin to rival (and there is a great deal of collateral damage in his wake). He is, indeed, a terrifying force for his enemies to behold. However, he is also a donut-scarfing doofus who loves to laugh, loves beautiful women (who constantly reject his advances), and loves to talk of love and peace. Oh, and he never kills, not under any circumstances. For anyone else, that would be tantamount to suicide, but he is extremely good at staying alive and protecting the people around him. He, perhaps more than any other creature on the planet, has the strength to hold to his peaceful resolve. 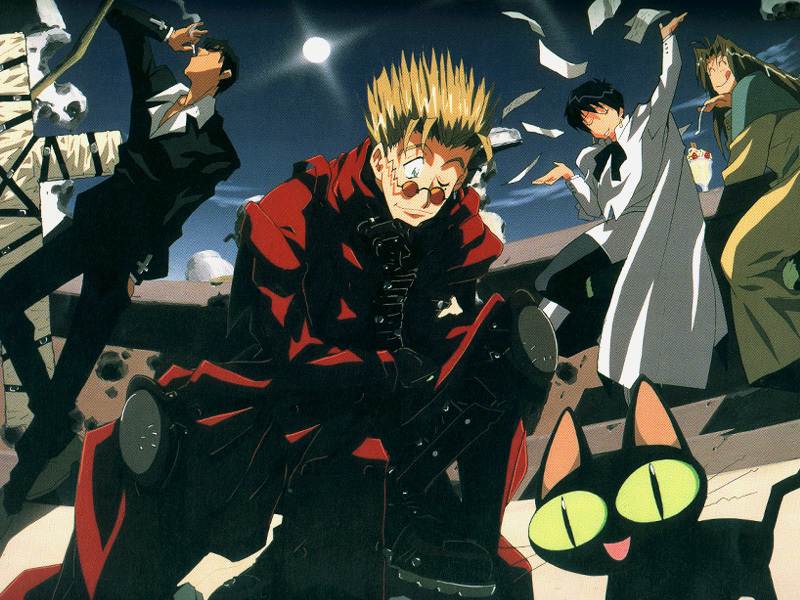 Naturally, the two images of Vash collide sharply with each other. Is he a mass murderer or a protector of the innocent? Well, as it turns out, his character and his life are much more complicated than people would like to think. That’s a huge part of the show, how messy things are. There are terrible situations all around, and really there is no single, clear solution. People have their misconceptions about Vash, but Vash is also guilty of approaching the world with the idealism of a child. He, like many others in the show, have their preconceived notions challenged. Enter the rest of the cast. Vash is a strong lead character, hilarious and entertaining to behold, but even he couldn’t carry a show like Trigun on his own. Thus we have Meryl Stryfe, Millie Thompson, and Nicholas D. Wolfwood. Our four main cast members… and the cat that shows up somewhere in almost every episode. Meryl and Millie are a pair of girls who work for Barnardelli Insurance, and they have been tasked by their bosses to find Vash the Stampede and keep him under constant surveillance. They’re a pretty comedic duo, with Meryl as the straight man, the serious one. She brooks no nonsense and stays on task, and look out if you get in her way. Millie is the sweet, innocent one with her head in the clouds, a walking heart of gold. She’s a ditz, and yet smarter than she seems, indeed smarter than even she knows, and she’s a strong emotional support to the rest of the cast. 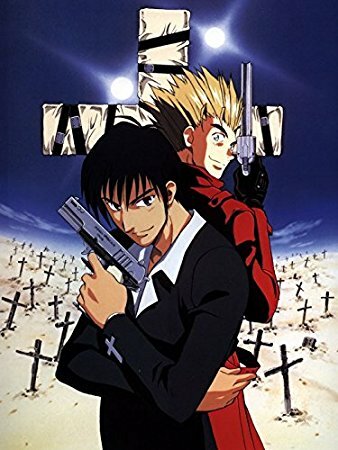 As for Wolfwood, a gun-toting priest, he is quite nearly Vash’s equal. The two of them are kindred spirits, alike in temperament, capabilities, and their desire to protect others. However, they’re divided by the question of killing. Wolfwood is a practical, cutthroat realist who does not hesitate to kill the people who threaten his friends and already have innocent blood on their hands. When it comes down to it, Wolfwood argues, the struggle to survive demands that they kill the enemy who is trying to kill them. It’s either kill, or be killed. That, there, is a huge part of what makes Trigun such a great show. Two men, of equal strength, who are clearly both heroes, are at odds with each other over a very compelling question. It’s a question that doesn’t have an easy answer, and even when an answer is found, holding to it with no degree of flexibility can prove utterly destructive. 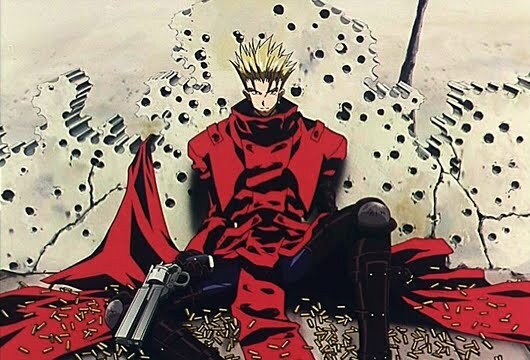 All of this as the overarching plot unfolds, and Vash is made to confront the greatest evil on the planet, an evil he has a direct, intimate connection to. The story of his past his revealed as he faces a number of diverse, deadly enemies, who stand against not only him but everything he represents. More ideologies clash, yet all of them, including the argument about killing, is but an extension of another, single argument: the question of whether any human, or any creature, has the right to stand above another. That last question is unequivocally answered: no. Other questions, however, are left with more vague resolutions. Indeed, the final words of the anime suggest that we might believe in what these characters represent, but we should look to ourselves as well, and find our own answers to guide us. Such is what it means to become an adult. The entire anime, you could say, is about Vash growing up. 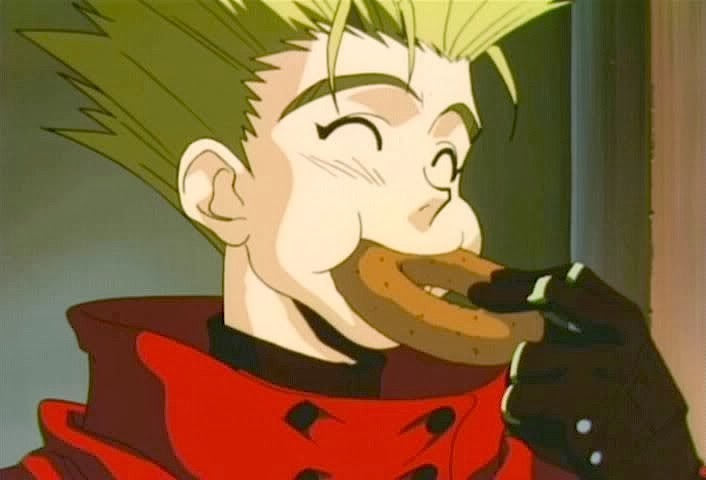 Basically, Trigun is just a really good anime. It’s a compelling story, well-crafted, well-paced, never dull. It has lovable characters who match and challenge each other over heavy, demanding issues. It’s hilarious and heart-warming, tragic and heart-breaking, dramatic and powerful, and it leaves us, the audience, to ask important questions of ourselves, and keep asking. It’s great! And that’s just the material! It would be remiss of me not to mention how fantastic every technical aspect of the show is. The animation, the voice acting, the music, it’s all superb! Heck, even the next-episode previews are like short poems, very easy to listen to. Really, the only thing that I dislike a little is the opening and closing sequences. It’s impressive, but I just hate music that screams at me, ya know? This anime, I am quite certain, will always be one of my favorites. This entry was posted in Anime and Cartoons, Tuesday Review and tagged Meryl Stryfe, Millie Thompson, Nicholas D. Wolfwood, Trigun, Vash the Stampede. Bookmark the permalink.